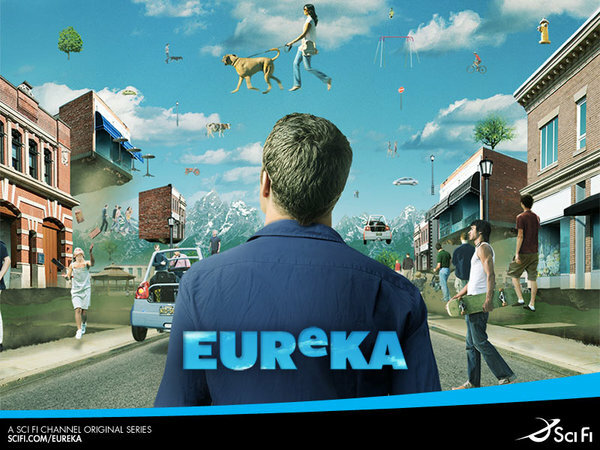 This week at SpockSoc, we’re showing Eureka. It got cancelled shortly before our last screening of it, leaving us with only one episode left to show, but has since gotten de-canceled, giving us more episodes to show, yay. By some coincidence, the episode immediately prior to the last one we showed will be on TV at Midnight on Friday, if people have been watching. Since it’s been a while since we last saw any, here’s a brief recap. Eureka is a town where America’s best scientists have been gathered together since Einstein created it during World War II. Essentially, the whole town is full of geniuses, who, when things go wrong (as they inevitably do) tend to wreak havoc with the very laws of time and space. Meet Jack Carter, formally a US Marshall, now town Sheriff. An average Joe who found himself being transferred to Eureka. He’s the only man in town stupid enough to actually solve the assorted things that happen. Figures. Other characters include his daughter Zoe, sister Lexi, love interest and boss Allison, deputy Jo, town mayor/mechanic/forensic/rocket scientist Henry, and general gofer guy Fargo. In any case, the first half of season three introduced Eva Thorne, also known as The Fixer – sent to Eureka to restructure Global Dynamics (the company that oversees the town) after a spot of espionage from a rival company almost resulted in secret technologies being stolen. However, Ms Thorne, unbeknownst to the other characters, has a history with the town. Something happened there right back in the thirties, before the town was built, and secrets still lie buried in the tunnels beneath.